TheMuseo Thyssen-Bornemisza and the Réunion des musées nationaux de France are presenting the exhibition hopper, to be shown first in Madrid then in Paris. It bring together the largest and most ambitious selection of works by the US artist ever to be shown in Europe, with loans from major museums and institutions including the MoMA and the Metropolitan Museum in New York, the Museum of Fine Arts, Boston, the Addison Gallery of American Art, Andover, and the Pennsylvania Academy of Fine Arts, Philadelphia, in addition to various private collections and with a particularly generous loan from the Whitney Museum of American Art, New York. The latter is sending 14 works from the Bequest of Josephine N. hopper, the artist’s wife. The exhibition has also benefited from the collaboration of the Terra Foundation for American Art. Within the context of Europe, hopper is one of the best known and most highly appreciated American painters. Despite this, however, his works have only been seen here in public exhibitions on a limited number of occasions. 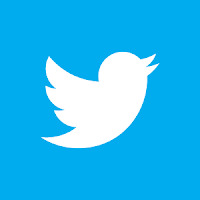 With the aim of rectifying this situation and of bringing his work to the attention of a wider public, two major cultural institutions of particular importance for the artist and his work have joined forces. The Museo Thyssen-Bornemisza houses the most significant collection of hopper’s works outside the United States, while in the case of the Réunion des musées nationaux, Paris and early 20th-century French painting were key reference points for the start of hopper’s career. Curated by Tomàs Llorens (Honorary Director of the Museo Thyssen-Bornemisza) and Didier Ottinger (Associate Director of the MNAM/Centre Pompidou), the exhibition include 73 works in Madrid. It offer an analysis of the artist’s work structured into two principal sections. The first open with hopper’s time in the studio of Robert Henri at the New York School of Art and cover the years of his training, with works from around 1900 to 1924 that start to reveal his particular and distinctive style. Paintings, drawings, prints and watercolours are displayed alongside various works by other artists including Henri, Félix Vallotton, Walter Sickert, Albert Marquet and Edgar Degas in a dialogue that recreates the one that existed between hopper and these artists at the time. The second section will focus on hopper’s mature work and is arranged thematically in order to emphasise the most frequently recurring themes and motifs in his work, while also maintaining a chronological flow. Modern Realism and Americanism, key attributes of hopper’s work Despite being an extremely popular and seemingly accessible painter, in the opinion of the exhibition’s two curators hopper’s works are among the most complex phenomena in 20th-century art. Hopper (Nyack, 1882 – New York, 1967) was one of the key figures within 20th-century realism although he worked for many years as an illustrator, totally ignored by the general public and critics. He sold his first work, Sailing Boat (1911), in 1913 and the second, The Mansard Roof, to the Brooklyn Museum of Art in 1923. It was not until the following year, at the age of 43, that he enjoyed the success of his first exhibition at the Rehn Gallery in New York and was thus able to devote himself fully to art. The Great Depression did not prevent major American museums and collectors from acquiring his work from this point onwards. In 1930 House by the Railroad (1925) was the first work to enter the future collection of the recently inaugurated MoMA in New York, donated by the celebrated collector Stephen Clark, one of the greatest champions of hopper’s work. Three years later, in 1933, the Museum exhibited more than 70 works in the first major retrospective of hopper’s career with loans from all over America. In the space of less than a decade hopper thus passed from being almost unknown to become one of the most highly esteemed living artists in the USA. Americanism and realism were key aspects of hopper’s work from the outset and his paintings offered a faithful portrait of America at the time, focusing on its most modern aspects but without any element of idealisation and presenting reality in a simplified manner. While hopper painted some landscapes and outdoor scenes, most of his works are located in public places such as bars, hotels, stations and on trains. These are almost empty settings with pronounced contrasts of light and shade that emphasise the solitude and drama of modern existence. 1.The Early Years In Robert Henri’s studio hopper absorbed a modern realism that represented a break from the prevailing academicism. His earliest works clearly reveal the relationship between his art and the American tradition pursued by Henri and Winslow Homer, who portrayed early 20th-century American society. In 1906 hopper moved to Paris where he remained for almost a year and to where he would return on subsequent occasions. Spending time in Paris was regarded as almost compulsory for American artists from the mid-19th century onwards. Contact with Impressionism laid the way for hopper to develop a particular approach to light and sensuality that would become key characteristics of his work throughout his career. In his works of this period he depicted the house where he lived on rue de Lille and its immediate surroundings. These images are to be seen in the present exhibition alongside others by the European artists who influenced him such as Albert Marquet, Walter Sickert and Félix Vallotton. On his return to the USA, hopper found himself obliged to work as an illustrator for professional publications and in advertising, an activity he considered degrading but one that he tried to adapt to his artistic vocation. At this point he discovered the narrative potential of the image and also improved his technique, both of which soon became evident in his painting. Many of the subjects on which he would subsequently focus, such as leisure activities, popular spectacles and events and office life, have their direct precedents in the drawings that he produced for these publications although the results were radically different: while his illustrations were positive images that appealed to consumerism and which depicted enjoyable leisure activities, his canvases expressed the apathy, drama and solitude of the characters to be seen in them. Hopper’s discovery of printmaking marks the first significant step in the evolution of his work. Despite the limited number of etchings that he produced, their format and technique - which locate them mid-way between the multiple image characteristic of commercial illustrations and the unique nature of a canvas - make them crucial to his output. In his etchings Hopper emphasised the contrast between black and white, using the whitest paper and the blackest inks available. Solitary figures, as in Evening Wind (1921), imposing buildings, such as The lonely House (1922), and striking compositional formats, as in Night Shadows (1921), all represent the first appearance of motifs that would subsequently recur in his work. Hopper produced his first watercolours in 1923 in the coastal town of Gloucester (Massachusetts). Most of them depict the town’s Victorian houses, as in Abbot’s House (1926) and Marty Welch’s House (1928). This was a subject with enormous dramatic potential due to the interplay of light and shadow on the buildings’ façades. Hopper’s discovery of this technique marks the second key moment in the evolution of his style. The chronology of Hopper’s paintings during his mature period reveals the key moments in the development of the major themes in his work. These themes include city life (From Williamsburg Bridge, 1928), intimacy, isolation and melancholy (Hotel Room, 1931; Room in New York, 1932), the approach of troubled times (Ground Swell, 1939), and the complexity of human relations (Summer in the City, 1949). Most of Hopper’s canvases depict scenes of daily life in the United States; American themes that interested his fellow citizens and ones that focused on modern life. At first sight they might seem to be extremely simple compositions but closer attention reveals a highly meditated approach to compositions that almost always involve an implicit narrative. In these scenes Hopper presents the figures alone or as couples or groups in which each one is isolated from the others with seemingly no communication between them. In Hotel Room in New York (1932), for example, there are two figures but while the man is reading the newspaper the woman on the other side of the table looks absently at a piano. Each is isolated in their own world. In addition to figure compositions, architecture was another favoured subject. On some occasions Hopper focused on isolated buildings such as the above-mentioned House by the Railroad, while on others the building is part of the urban context, as in The City (1927) and Manhattan Bridge Loop (1928). In this second type of composition Hopper looked for a way to make the building or structure stand out from the rest. The use of light is one of the most distinctive, characteristic and recurring features of Hopper’s work: “perhaps the most powerful and personal of Hopper’s expressive devices”, in the words of Alfred H. Barr, director of the MoMA between 1929 and 1943. Sunlight during the day or electric light at night enter through the windows and illuminate the scene, modelling each detail in the canvas. 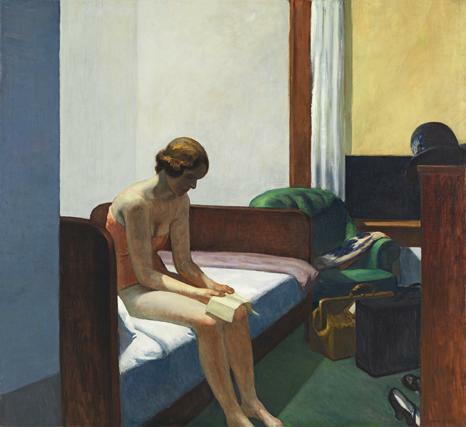 This is the theme of more than half of Hopper’s final twenty paintings, including Morning in the City (1944), in which a woman sunbathes naked in the morning light, Conference at Night (1949), bathed in neon light that enters from the outside, and Morning Sun (1952), in which the woman seems to be looking for something in the beam of light that falls on her as she sits in bed.